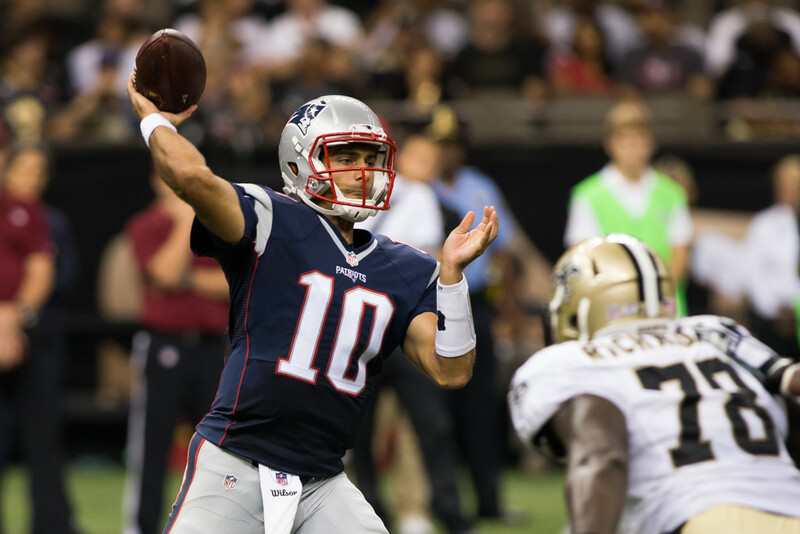 We know Garoppolo will start the first four games, but who will surround him on the roster? Today marks the final day of training camp practice open to the public, with the Patriots and Bears holding a walk-through in advance of tomorrow's preseason game. While camp and preseason action will continue for another two weeks, reporters will only be present during the stretching and warm-up portion of practice, meaning far less insight into how some of the tightly contested roster battles are playing out. With that in mind, now is as good a time as ever to check in on the Patriots roster, with an eye towards projecting the final 53 man roster. The Patriots have clearly locked into their plan of having Garoppolo start with third round rookie Brissett as his backup during the Tom Brady-less opening month of the season. While he's had his ups and downs this camp, Garoppolo has shown enough to suggest that he can at the very least manage the offense, particularly if he has enough of the team's top weapons surrounding him. Brissett is still raw, but his physical tools are obvious and he seems to have improved throughout camp, noticeably processing his reads quicker than he did in the spring. Brady will not count against the 53 man roster limit while suspended during the first four weeks. He's eligible to return Week 5 and will presumably be as focused and angry as we've ever seen him upon his return. The only whispers we've heard out of Foxboro suggests that the team is being extremely cautious with Lewis, who is merely nine months removed from tearing his ACL. While the reports indicate the Patriots expect to have Lewis for Week One in Arizona, it's concerning that he's barely been spotted during camp, not even doing conditioning with fellow injured players. If Lewis begins the year on the PUP list, he won't be eligible to be activated until Week 7 and won't count against the roster during that time, likely allowing another runner to claim a job. White is far less dynamic than Lewis, but has developed into a reliable option for Lewis' passing down role. He sticks as important insurance for the notoriously fragile Lewis. Bolden is unlikely to have a major offensive role, but he can provide depth both as a between-the-tackles runner and as a passing down option. Most importantly, Bolden is a core special teams contributor, which should keep his job safe for another season. I still consider it far more likely than not that Blount opens the season as the team's top early down option, but his lack of versatility could put his roster spot in jeopardy if Gaffney continues to push him for that role. Unlike Blount, Gaffney has displayed some passing game chops, including an impressive showing in blitz pickup during last week's preseason opener. Gaffney has also been active on special teams, unlike Blount. With the two seeming to split first team reps recently, the onus is on Blount to prove he's considerably better as a primary ball-carrier. It's conceivable that the team could keep both, but doing so would be at the expense of depth somewhere else on the roster. Injuries appear to have sunk both the veteran Brown and undrafted rookie Foster's chances of earning a roster spot. Foster could be a prime candidate for the practice squad, as he had coaches and beat reporters excited about his potential before a nagging hamstring injury sidelined him early in camp. Iosefa has practice squad eligibility as well, where he could be stashed as a developmental power back. Gaffney also has practice squad eligibility, but would be less likely to pass through waivers unclaimed if the team attempts to go that route. The picture at receiver is muddied by injuries, as two of the team's top four options (Danny Amendola and Mitchell) appear to be questionable at best for Week One. This could mean an expanded role for Hogan early in the season, who should get his first live reps with Garoppolo tomorrow night against the Bears. Edelman reportedly looked healthy yesterday in practice, embarrassing the Bears defensive backs throughout practice. He'll have to stay that way, as any setback with his foot could push some of the bubble guys into key roles during the Garoppolo lead start to the season. Will Amendola be ready for the start of the season? Camp began with optimism that Amendola would soon return to the fold, as he was commonly spotted running routes and sprints off to the side at full speed with Edelman. 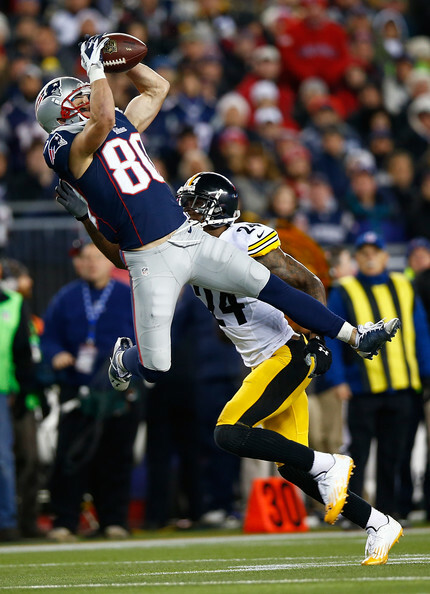 However, while Edelman has returned to practice, Amendola remains sidelined. More troubling, Amendola hasn't been spotted running with close to the intensity he showed earlier in camp. In fact, beat reporters have noted that he's merely been throwing passes while his fellow injured players run routes during their conditioning sessions off to the side. Common sense strongly suggests there's been a setback of some sort, so I'm projecting him to begin the season on the PUP list, keeping him sidelined for at least the first six weeks of the season. If Amendola does begin the season on the PUP list, it would likely open up a job for an extra name from this list. Martin appeared to be a frontrunner coming into camp after building momentum last year as a mid-season pickup, but he's spent much of camp sidelined with an undisclosed injury. The primary beneficiaries of his absence have been Dobson, whose had a solid if not spectacular camp, and Carter, who seems to make plays every day despite his diminutive size and undrafted status. The two could not be more different stylistically, as Dobson brings prototype size to the outside "X" position, while Carter is a slot jitterbug in the mold of Edelman and Amendola. Others in the competition include veteran deep threat Washington, who's attempting to overcome missing the beginning of camp with an undisclosed illness, second year man Harper, who has quietly had a solid camp, and seventh round pick Lucien, who has shown up more recently after a slower start to camp. Harper, Lucien and Carter all have practice squad eligibility. Quite the no brainer here, as Gronk and Marty project as a dynamic duo. While both are better known for their pass catching prowess, they are also amongst the best in-line blockers at the position in the league, which should put defenses in some real match-up quandaries when the Patriots go to their preferred 12 personnel. Matching up with nickel personnel makes the defense more vulnerable to the run, but matching up with base personnel could be a death sentence against the pass. 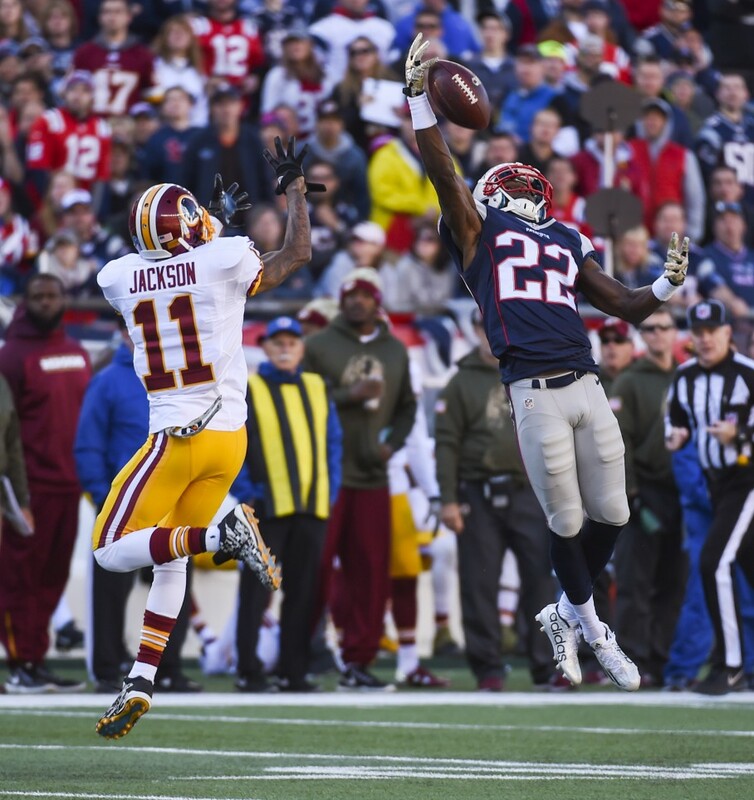 That tactical advantage could be key to the Patriots offense all season. The veteran Harbor appeared to be the frontrunner for third tight end duties coming into camp, but a rough camp combined with yesterday's apparent injury could have him on the outside looking in on cutdown day. That could open up a spot for Derby, who's flashed impressive pass catching potential both in camp and in the preseason opener. With the Pats typically carrying a blocking tight end amongst their depth options, veteran Bear Pascoe could be another option. Undrafted rookies Scheu and Williams round out the depth chart, with Williams' injury absence quelling the momentum he generated earlier in camp. Meanwhile, Develin brings a physical aspect to the offense as a lead blocking fullback that was missed after he was lost to a season ending injury last year. I'm projecting him to make the team, which could only leave room for one tight end behind Gronk/Marty. Derby, Scheu and Williams all have practice squad eligibility. With Sebastian Vollmer still on the PUP list and not spotted throughout training camp, these two have been locked in as the starters. Solder looked a bit rusty last week in his first game action since tearing his bicep back in Week Five. A return to form from him would do wonders for the maligned offensive line, as Solder has been one of the league's better left tackles when healthy. On the other side, Cannon has looked better than he has in years (not that that's saying much). The team hopes that a return to health will combine with the coaching of Scarnecchia to coax a return to his 2013 form, when he was a serviceable starter at right tackle after Vollmer broke his leg. There's still plenty of time for Vollmer to return to health and get back out there, but the fact that he hasn't even been seen at camp is far from encouraging. The 32 year old veteran dealt with nagging knee injuries last season which clearly affected his performance, and his continued absence from practice suggests that he's not close to be ready for game action yet. This storyline hasn't received much attention in camp, but it could be a very big deal once the real games start if Cannon struggles to fill his role. With no sign of his imminent return, I'm projecting him to start the year on the PUP list. Waddle has consistently worked as the second string left tackle during camp, with former fourth round pick bookending him on the right side. While both players have struggled to handle speed at times, I'm projecting both to stick as depth options given the importance of the tackle position. Waddle in particular deserves a longer look, as he's working at a new position after beginning his career on the right side. 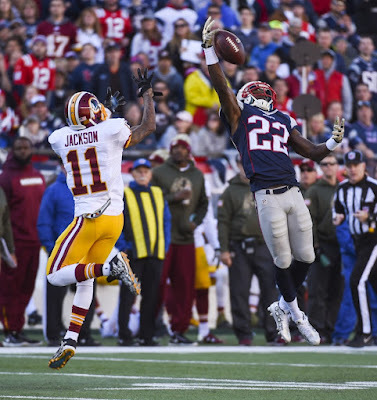 The competition is rounded out by Milton, a former undrafted player who has spent two seasons on NFL rosters as a reserve (2013 Browns, 2014 Seahawks) before catching on to the Patriots practice squad last year, and Barker, who has stuck around in New England due to his inside/outside versatility. All but Waddle have practice squad eligibility. Given Dante Scarnecchia's early camp assertion that the Pats would pick their five and stick with them, it's looking increasingly likely that Thuney and Mason begin the season as your starting duo. Thuney has stepped in as a rookie and looked like their best lineman in camp, handling himself both in team drills and one-on-ones like a veteran. His performance carried over to the live action, as he was PFF's top graded guard amongst players facing starters during Week 1 of the preseason. On the other side, Mason has ascended to the starting right guard spot since being activated from the PUP list early in camp. The Patriots clearly love Mason's upside as a run blocker, but his rookie year pass protection struggles continued into last week's preseason opener. Continued struggles as a pass blocker could open the door for Kline, a veteran who was the Patriots most consistent lineman last season. If things currently stay as is, Kline would project has versatile depth at guard and center, where he's taken some snaps with the second team. Jackson has yet to be removed from the PUP list as he continues to recover from offseason knee surgery. While his continued visible presence on the practice field working on conditioning with fellow injured players is a good sign, the team's depth on the interior allows them to stash him on PUP for the start of the season if need be. Jackson was solid if not spectacular as rookie, arguably putting out more consistent tape than his fellow rook Mason, and he'd project as solid depth if/when activated. On the surface, it would be shocking to see Cooper released. The former top 10 pick was considered a centerpiece of the Chandler Jones trade and was running with the starters at right guard prior to his going down early in camp. However, the diagnosis of plantar fasciitis is certainly a troubling one for a player known for his athleticism. Cooper has struggled to stay healthy throughout his star-crossed career and an injury that requires prolonged rest to heal has led to his falling behind in a tightly contested battle for the starting right guard job. One of the primary beneficiaries of his absence has been sixth round rookie Karras, who seems to have won the coaches over with his toughness and versatility. Like Kline, Karras has helped his case for a roster spot by taking reps at center as well. Halapio is a 2014 sixth round pick of the Patriots who was released as a rookie, only to be re-signed this summer. Belichick has noted Halapio's improved conditioning from his rookie form, but he remains a roster long shot. He and Karras carry practice squad eligibility. This began as an open competition, with Andrews and Bryan Stork rotating daily between the first and second team. However, Stork's missed time with a concussion opened an opportunity for Andrews to seize the role and he hasn't looked back since. At this point, it would take either an injury or a drastic drop off in play from Andrews for him to lose the starting job. Belichick has noted that he's improved noticeably this summer from the impressive form he showed last year as an undrafted rookie. One thing to improve upon is his making calls at the line, as miscommunications seemed to lead to several pressures on Garoppolo during the preseason opener. On the surface, it would be shocking if Stork was outright cut just a year and a half removed from starting for a Super Bowl champion as a rookie. However, Stork appears to be clearly behind Andrews for the starting job and carries some significant question marks going forward. First and foremost is his health, as Stork now has four diagnosed concussions in the past four football seasons. Through no fault of his own, we're at the point where it's hard to count on him staying healthy and on the field. Furthermore, Stork's on field discipline is a major question mark at this point. Yesterday marked the second time this offseason he's been ejected from a practice for fighting, and he risked (and at times earned) some costly penalties during last year's playoffs with his chippy play. Combine that with the ability of Kline or Karras to step in at center if need be and Stork could become expendable. With limited depth spots available on the roster, the team could opt to use Stork's spot on a player with less long term risk and more developmental upside. What seemed to be one of the deepest position groups on the team has been ravaged by injuries recently, with Ninkovich, Sheard and McClellin all going down to injuries during the past two weeks. Nink should be back by October at the latest, but the extent of Sheard and McClellin's injuries remains a mystery at this point. A serious injury to Sheard would be devastating, as he projects as the team's top pass rusher. McClellin has also looked good in camp and the first preseason game, playing a hybrid role as a stand up outside linebacker capable of rushing the passer, setting the edge or dropping back into coverage. On the bright side, the remaining players from this group have looked good as well. After missing much of the past two seasons with injuries, Long looks healthy and explosive, regularly creating disruption in practice. Flowers, meanwhile, flashed dominance during the preseason opener and will look to build off of that performance tomorrow night against the Bears first string offensive line. While Grissom is listed as on the bubble due to the shear volume of players ahead of him on the depth chart, I suspect he winds up on the roster due to his value as a core special teams contributor. Grissom also brings versatile depth on defense as a player capable of playing both on the edge or as an interior rusher on passing downs. Meanwhile, Johnson flashed potential as a big, physical edge rushing linebacker last preseason and flashed with a some pressure in last week's opener. He overcame long odds to make the roster last year and will have to continue to impress to replicate that feat this year. If one of the aforementioned injuries to the "locks" is more serious than we anticipate, it could open up a depth spot for him. 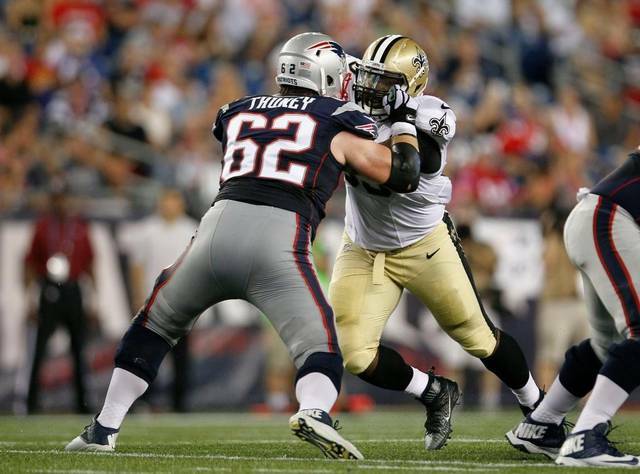 The Pats went to great lengths to make sure they replaced the snaps lost by the free agent departure of Akiem Hicks, signing the veteran Knighton to a one year deal and spending a third round pick on Valentine. All four of are bigger bodied tackles who excel at clogging rushing lanes and occupying multiple blockers, freeing things up for the deep group of edge rushers listed above. Brown figures to lead this group in snaps and should build off of an impressive rookie season that saw him get better and better as the year went on, while veterans Branch and Knighton figure to rotate beside him. Barring a dramatic improvement, expect Valentine to essentially redshirt this season as a gameday inactive who will be expected to step up into a larger role next offseason. Of these guys, Kuhn seems to be by far the best bet to earn a spot, as the former Giant has rotated in with the first team defense throughout camp. Kearse is a journeyman who has lasted five years in the NFL, with most of his active NFL experience coming in 2014 for the Redskins. Vellano has hung around New England as a back of the roster type since 2013, when he was unexpectedly thrown into a starting due to a rash of injuries on the interior. Hamilton is an undrafted rookie from Ole Miss, while Johnson has bounced around since entering the league as an undrafted rookie in 2014 for the Dolphins. Hightower and Collins are obvious, as the duo have served as the core of the defense for the past two seasons and will continue to do so this year. Hightower is a bigger and more physical, while Collins is more athletic, but both bring versatility that makes them unique chess pieces for defensive coordinator Matt Patricia. Both are monsters when called upon to rush the passer, allowing Patricia to create constant confusion with regards to who will rush and who will drop back into coverage. That will play a big factor in how the team deals with the loss of Chandler Jones, and could take on a higher importance if Sheard misses any regular season time. Freeny appears to be well ahead of the rest of the depth chart as the third linebacker. In the past, that would make him a starter, but the amount of nickel defense the Patriots play relegates him to a backup who will only see a significant role if one of the aforementioned studs ahead of him misses time. When on the field, Freeny is much better against the run than the pass, but he brings additional roster value as a capable special teams contributor. I nearly put Grugier-Hill, now conveniently nicknamed "KG" by his peers, on the locks list. That's how confident I am in the sixth round pick making the roster. At the very least, "KG" projects as a core special teams player, but his performance in training camp suggests that he could carve out some nickel or dime snaps on defense as well as a linebacker. At 6'2" and 220 pounds, he's extremely light as a traditional linebacker, but fits the hybrid linebacker/safety mold that has become trendy thanks to the success of Deone Bucannan and Mark Barron. 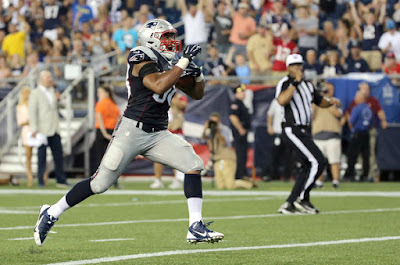 His speed in pursuit showed up in last week's preseason game, as he seemed to be constantly around the ball. Veteran free agent Ramon Humber projects as a special teams contributor, but seems far behind Freeny in the competition for depth as a base linebacker, as does sixth round rookie Roberts and second year man Kevin Snyder. All but Humber have practice squad eligibility. Can Coleman hold off Jones for the nickel corner job? Butler and Ryan return from a successful 2015 season that saw each player excel in his first season as a full time starter. With Butler set to hit restricted free agency and Ryan the unrestricted market, both could be playing for a significant pay raise next spring. The only real question mark here is who emerges as the third corner in nickel packages between Coleman and Jones. Right now, Coleman appears to have the upper hand, as he's had a very competitive camp following a mostly impressive rookie season in that role. Jones, the team's second round pick, could earn his way onto the field sooner rather than later. In the meantime, he brings immediate value as the primary kick and punt returner. Given the match-up man tendencies of the Patriots, the playing time split between these two could be determined by opponent, with Coleman offering more reactive athleticism and Jones being the more physical press option. These five are fighting for what will likely be just one roster spot, with none of them fully separating from the pack just yet. The most talented player on the list is probably Roberts, a seventh round pick who was sidelined by injury last year after an impressive start to his rookie training camp, but he's failed to make the second year leap many (myself included) had projected for him. He does carry more special teams value than his competition on this list, playing plenty of snaps as both a gunner and a vice on the punt coverage and return teams. Veteran EJ Biggers has the edge in experience, but he's failed to stand out in camp. One name who appears to be crawling up this list is undrafted rookie LeBlanc, who appears to have caught the coaches eyes with an impressive recent stretch that belies his lack of size. Fellow undersized and undrafted rookie Jonathan Jones has also had some good moments and has plenty of athletic potential, while undrafted rookie V'Angelo Bentley has gotten more reps as a return man than at corner. All but Biggers have practice squad eligibility and it would be surprising to me if at least one of these guys isn't stashed as a developmental prospect. Few surprises here, as safety is one of the deepest positions on the Pats roster. McCourty and Chung form one of the best starting duos in the league, with Chung excelling at covering tight ends and McCourty keeping the defense together from his all-important deep centerfield role. Harmon's ability to play the same deep centerfield role as McCourty gives Patricia great flexibility, enabling him to utilize McCourty's man coverage ability if the matchups call for it without losing any security on the backend. Meanwhile, last year's second round pick Richards seems to have earned respect from coaches and players for his improvement from year one to year two. With this much depth ahead of him, he's unlikely to see a major defensive role barring injury, but projects as excellent depth and as a special teams contributor. It would be unusual for most teams to keep six safeties, but it's hard to imagine either Ebner or King left off the roster due to their excellence on special teams. The same can't be said for Vinnie Sunseri, a former fifth round pick of the Saints. Sunseri was a special teams standout throughout his college career at Alabama, but he's had each of the past three seasons derailed by injuries, including his second torn ACL last year. The same goes for Cedric Thompson, an athletic fifth round pick by the Dolphins last year who failed to make their roster and was plucked off their practice squad last year. King, Sunseri and Thompson all have practice squad eligibility. No surprises here. Gostkowski and Allen go into camp facing no competition to their jobs after a successful 2015 season. Slater is nominally listed as a receiver, but his true contributions come as one of the top special teams players in the league. I have 39 roster locks listed, not counting players who will be suspended or are projected to begin the season on the PUP list. That leaves 14 projected spots up for grabs, with several of those spots having heavy favorites (Kamu Grugier-Hill, Geneo Grissom, Markus Kuhn, etc) already in place. Needless to say, the competition for the final spots on the 53 man roster figures to be extremely tight over the next few weeks.